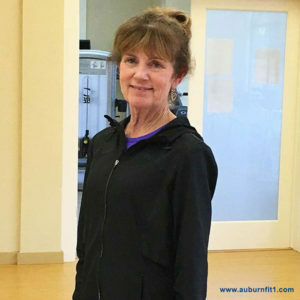 Auburn Fit 1 is proud to introduce this month’s fitness instructor to notice, Wendy Beress. Wendy has worked in the health and wellness industry for 37 years. Her journey began with becoming a Licensed Physical Therapist, where she built a solid foundation of knowledge and practical experience for her current fitness practice. Over the years, she has added Personal Trainer, Massage Therapist and most recently, Pilates Instructor to her repertoire. She incorporates her extensive education and passion for health and well-being into creating the most beneficial and successful experience for each and every one of her clients. To personal train with Wendy, please contact the Auburn Fit 1 office.